So … there’s been a lot of talk about Nanoblur recently. It’s been hailed as the latest wonder product, and claims to make you look ten years younger in 40 seconds. It’s now available in Boots, and it costs £19.99. I’ve had a tube for a couple of weeks now, so how does it do? Nanoblur is, essentially, a silicone-based primer, suffused with micro-prisms which will refract light, and make lines and wrinkles (and other flaws) seemingly “disappear”. The nano particles are the wonder ingredient in this particular melange, as the rest of the product doesn’t really offer any skin-care benefits over and above what you’d be using on your skin anyway. You can use it over your moisturiser if you’re going bare-faced, or, the packaging alleges, that you can use it over your foundation, if you’re going for a fully made-up look. I’ve not been in the mood for much makeup lately, so I’ve been wearing it over moisturiser only. It’s a white cream, which I find quite difficult to spread, and this means I have to apply quite a lot. My skin adores my current skin-care regime (Darphin, mostly), and is more than adequately hydrated, but still I find this stuff patchy in application, and once dry it gives me matte finish to my skin. I have severe and grave misgivings about how this would work over foundation, if it goes patchy over moisturised skin, I suspect it wouldn’t mix too well with anything pigmented. It’s a very matte finish. A TOO-matte finish, if truth be told. My skin is combination-oily, and I know that if I were using this during my more dry-skinned phases, then this product would be a complete and utter no-no. It doesn’t have any lifting or tightening effects (and doesn’t promise them), but I do find that my skin is a little more “taut” when I’m using this. I have to say that not one person (including my nearest and dearest) noticed whether I was wearing a full OR a half face of this stuff. I did, however. In my defence, I didn’t tell them, but … Yes, I did find that it softened lines, and made some flaws more difficult to focus on, but the difference wasn’t, at all, as noticeable as promised. It’s … okay. I guess. The lack of amazing results, and the matte finish (which is actually ageing in itself when you’re past a certain point in life) means that Nanoblur isn’t a must-have for me. Add in my reservations as to how it would work with makeup, and I’d have to say that it’s not really for me at all. A day without foundation is a day wasted as far as I’m concerned. 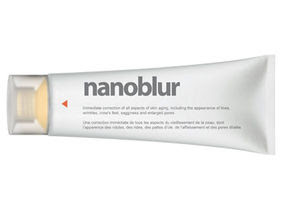 However, if you have very greasy skin, you might get on better with it than I did, but if you’re over forty (as I most decidedly am), then I recommend that you approach Nanoblur with extreme caution. I've been very surprised by how many people seem to have gone nuts over this stuff. Granted, I haven't tried it myself so I'm not really one to judge, but from the pictures I've seen it seems nothing more than a mattifying product which, as you say, can actually be ageing. Not one for me I wager. It just looks like it's matte-fied those faces in the before/after shots. If it was easier to apply I'd give it a go, but your description of the application doesn't really work for me. I don't like a mattified skin on myself, it definitely ages me so this is one for me to miss. Application over foundation sounds so difficult to achieve. Maybe poorly applied foundation would make me look like my 25 year old self though? I.e. inept! Not really my thing, but ive heard lots about it. There's a nanoblur product(this one i think!) soon to be available on buyapowa.com where it'll be available at possibly less than half price, just so everyone knows! I too have oily / combination skin but think I will give this a miss. If I want to have a matte base I usually just powder over my current foundation and that keeps the shine at bay for the day. I've heard a lot about Nanoblur but pretty much everyone has said it is difficult to put on over foundation so its a no for me. I just had to try this product myself and your review is spot on. I stupidly tried to apply foundation on top and the result was appalling!